Plenty of cheap cars at BCA Blackbushe today, and more on Bank Holiday Monday. 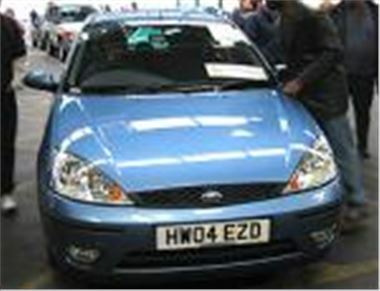 The 303 mile 04 registered metallic blue Focus 1.6 Zetec 5-door in the photo lists at £12,737 and would probably set you back about £11,000 via a broker or supersite. And it wasn’t the only nearly new bargain in the Motability section. A 272 mile 2004/53 reg Vauxhall Meriva 1.6 Enjoy with a/c bid to just £7,950 provisionally, and this car lists at £12,197. In comparison, an 1,830 mile 2003/53 reg Micra 1.2S 3-door automatic looked a bit dear to me at £6,550, but it was subject to a bidding battle. Whereas a 656 mile 2003/53 Renault Clio 1.2 Expression with “auto clutch” sold for £5,600. Other cheap nearly new cars today included a 9k mile 03 reg Audi A4 TDI V6 163bhp Sport Avant, sold for £19,650; a nice 11k mile met grey manual 2003/53 Jag S-Type 2.5 V6 Sport, sold for £16,900; and a 3,600 mile 2004/53 facelift Honda Civic 1.4E 5-door bid to a provisional £7,400. Interestingly the base model E has a CD radio, but comes without the console fitted to higher spec Civics since March 2003. Also far from dear, a 97k mile 2000X Mercedes E320 CDI Elegance estate bid to £12,000 provisional; 109k mile 2001Y BMW 320iSE 2.2, sold for £8,750; a 102k mile 2001/51 reg BMW 525iSE bid to a derisory £8,300; a 75k mile 2001Y Mitsubishi Galant 2.5 V6 auto, sold for £4,800; while cheapest cheapie had to be a 112k mile 99T Focus 2.0 Ghia estate, sold for £2,750. Bank Holiday Monday’s event at Blackbushe includes General Fleet and Finance, Lex Vehicle Leasing and Bank of Scotland. Plus par exchanges from Inchcape, West London Nissan, Reg Vardy, Harwell, Pendragon, and New Way.